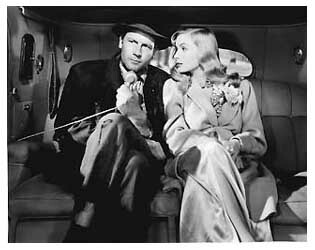 "Veronica Lake's on the take!" 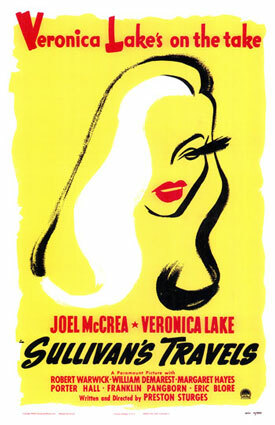 boasts the iconic poster for thirties-flick Sullivan's Travels. But, though the blodne siren with the peek-a-boo bang does appear on film, that tagline might be a bit of a misnomer. The movie is less about Ms. Lake bumming her way across the heartland and more about the need for a good laugh. Sullivan's Travels is a movie by a comedy director who's trying to make a serious point. It is also about a comedy director who wants to make a serious point. Cue ironic laughter. Sullivan is a sucessful Hollywood director who's built his career on musicals and comedies. Now, he feels that in the face of the Great Depression his movies should reflect the serious and tradgic turn life has taken for many. He wants to capture on film the gritty grandur of the Steinbeck-like book O, Brother Where Art Thou (some of you pop culture know-it-alls might have heard of this title elsewhere when other entertainers have paid homage to this film). His producers are quick to point out that, born of privilege and instantly sucessful as an adult, this young man knows next to nothing about tradegy- but he intends to find out! Sullivan takes off cross-country to get the feel for life as a hobo. He gets in and out of one crazy hi-jinks after another, including a high-speed chase with a kid's race car, two amourous, lonely ladies, and meeting a washed up actress who insists on hanging around. But a surprising twist stops all the fun and games, and instead forces Sullivan to see the truth: when life gets hard, we could all use a little laugh. Though hailed today as 1930's Comedy King Preston Sturges,' masterpiece, Sullivan's Travels fell flat for me. It could have taken some of its own advise, and remembered everyone wants a laugh over a sermon. Some scenes preach and others give us gags, but rarely is there one doing both, creating a sense of uneven pacing and leaving an unpleasant taste of didactic writing in one's mouth. As a viewer, I also was unimpressed- and occasionally confused by- the montage sequences, which are plentiful in the film. All this is not to say the movie is without its strong points. A pivotal scene in the movie caused the National Association for the Advancement of Colored People (NAACP) Secretary, Walter White, to write to Preston Sturges, and congratulate him for his "dignified and decent treatment of Negroes in this scene." While probably not entirely accurate, I also felt that the film at least attempted to give a three dimensional feel to those in extreme poverty during the Depression. While we met both saints and sinners amongst "the great unwashed" of the film, most people were neither entirely one or the other. In fact, Preston created a script where all, even the smallest parts, felt very fleshed out, as if the story could just as easily have followed the life of the cafe waiter or the movie producer as it could the Hollywood director. My favorite part of film though was the short blonde "on the take." The studio came up with the tagline to side-step the sticky issue of explaining what an unmarried, sultry looking woman was doing sleeping next to- and travelling with- a married, but very interested American Male. Whether she's the star or not though, she's certainly the best thing up on the screen! My favorite scene in the movie is Lake's introduction. Many of the characters seem fleshed out, but she seemed real in that scene, with a hard edge and soft acceptance of failure. She's not only beautiful in this scene, but funny too. The beauty comes and goes scene to scene, depending on if she's dressed up as a hobo with her signature hair in her hat, but that humor remains every time she's in front of the camera. Sadly, as much as we might love her in front of the camera, many of her coworkers hated having her on set. At the time of filming, Lake was six to eight months pregnant. She didn't tell anyone till she had been signed on, fearing they might not cast her due to the physical demands of the role. In the end, only three people were told- the director Sturges, who, on finding out, supposedly had to be restrained from hurting her; his wife; and the costume designer whose task it was to get costumes that disguised this fact! Lake was notoriously hard to work with too, possibly because of some mental illnesses, and co-stars had turned down great roles to avoid working with her again. Despite my own quibbles with it, Sullivan's Travels cracked the American Film Institute's tenth anniversary edition of their "Top 100 American Films," placing sixty-first. It might even deserve it. I leave that to you to decide. Besides, who wouldn't waste an hour just to see what is behind that peek-a-boo bang? Thank you for your sweet comment. So funny she was pregnant during filming. I always wish I had time to catch up on classic movies like this! Veronica Lake is also my hair inspiration!